Revelstoke, BC is located on the Columbia River between the Selkirk and Monashee Mountains, surrounded by deep glacial lakes and pristine alpine terrain. Incorporated in 1899, Revelstoke is known for its Victorian-era heritage buildings, 40 feet of champagne powder snowfall annually, and small town hospitality. Community events like farmer's markets, winter festivals, and live summer entertainment make Revelstoke a popular year-round destination, in addition to the world class ski and snowmobiling terrain. When will it snow in Revelstoke? The next notable snow forecast for Revelstoke is 4cm2in, expected on 24 April, with around 12cm5in forecast over the next 7 days. The Canadian Ski Resort of Revelstoke has direct access to a total of 5 ski lifts. With ski lifts as high as 2,225m7,300ft, snow cover is generally reliable. Revelstoke is highly rated by Snowboarders and there is a Snow Park in Revelstoke. We don't currently have confirmed season dates for Revelstoke. NOTE:- Lift and Piste openings are always subject to Snow Conditions in Revelstoke. The five ski lifts of Revelstoke are able to uplift 4,000 skiers and snowboarders every hour. Revelstoke is in Columbia-Shuswap B, Columbia-Shuswap, Canada. The nearest airports to Revelstoke are Kelowna and Kamloops, all within three hours drive. Want to Know when it Snows in Revelstoke? 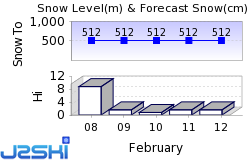 Click above to get Snow Reports by e-Mail for Revelstoke. By doing so, you agree to Our Rules. Want to ask about skiing and snowboarding in Revelstoke? Or contact Revelstoke Tourist Office. Note :- The information on J2Ski concerning Revelstoke, where not clearly factual, is opinion only and is neither definitive or exhaustive.